The mainstream media has been shamefully slow to catch on, but via social networks and inspired by a collective dissatisfaction with the protected status of the financial business world, Occupy Wall Street has spread to cities across the nation. Our own Occupy Chicago protesters have been active for some weeks now, teaming up with the likes of striking union workers and students at urban campuses. I had been hoping to find time to see what the group was up to when I found myself meeting the marchers at close range. Yesterday, around 6pm, a group of protesters walked up State Street toward Lake from Jackson, banging drums and chanting "Wall Street got bailed out, we got sold out." 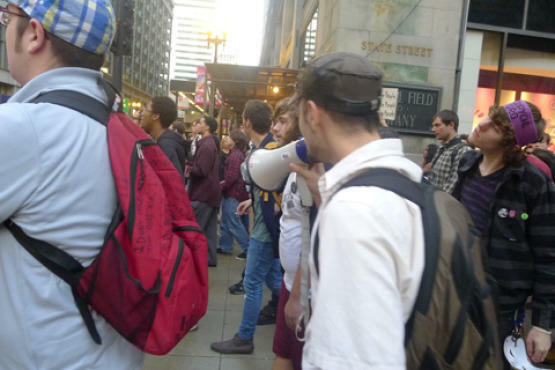 I'll be out again today and hopefully have a chance to talk to some of the Occupy Chicago folks face-to-face. Look for some video interviews on the blog tonight.